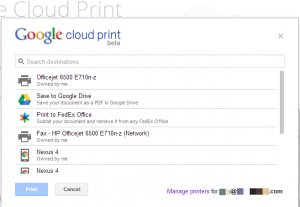 Cloud Printing is printing only it uses the cloud to connect your printer. Agreed, that sounds a bit circular but bear with me. When you print from your computer you must have a printer available. When you do then you can direct a print job to it. First off you must have a printer that is cloud enabled or can talk to the cloud. Most new printers today have it and they have been available for a few years now. You’ll have to look at your printer setup. Once it’s registered then follow instructions to set it up. 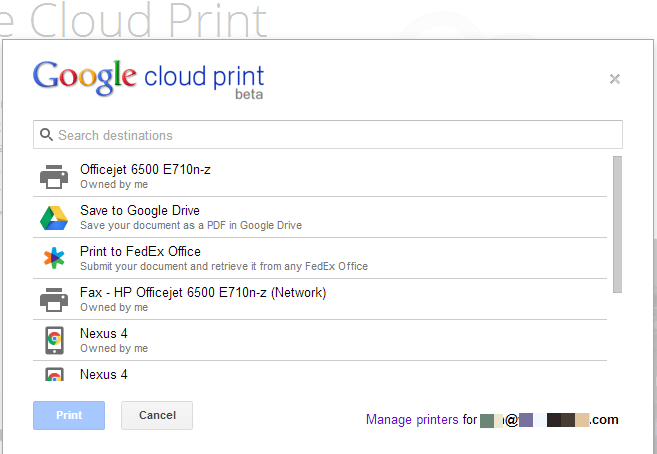 Go to google.com/cloudprint and you can setup your new cloud printer and make it available to your Google account. 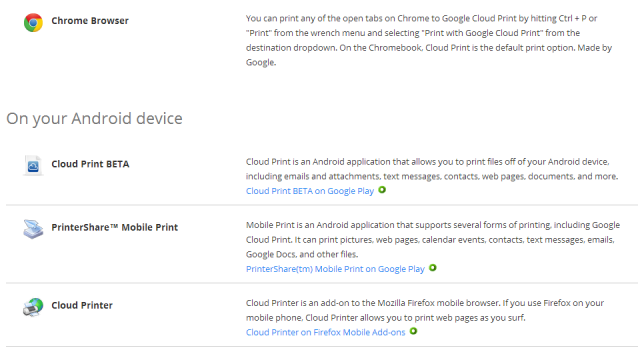 To use it from Chrome just hit the print link and you’ll see your printers. The beauty is that you don’t have to be on your local printer network, you can be anywhere. Google now has an Android app (there has been 3rd party ones). Which means you can print directly from your phone. This is no small feat, printing from a phone means the network issues get complicated. You know how in Windows you have to reboot your computer and sometimes restart your printer to get it recognized so you can print? Well yeah, that happens here too. Definitely, if you are on the go and have things that come up on your phone that you need to print, this is great. No more emailing yourself a document and going to your computer and downloading it then printing it. In fact you can print it before you get home or to the office and it’s there ready to go.